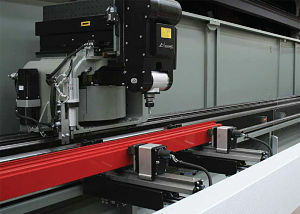 We have the ability to fabricate up to 30’ long extrusions, which are processed in our high speed Emmegi CNC machines. These particular units have a 4+1 controlled axis. The 4th axis allows the spindle to be continuously controlled in the range of 0-180 degrees. In addition to spindle rotation, we have on hand, angle machining heads for that are responsible for machining the 5 faces of a processed part. These high speed units can machine, drill, and tap at extremely tight tolerances consistently, for application perfection for your part! 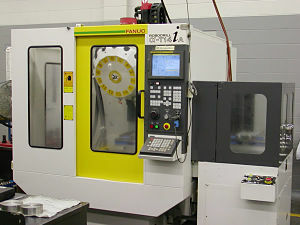 We also have the ability to fabricate parts from ¼” up to 27” long in our high speed Fanuc Robo Drill units. These machines operate off of 3 axis high speed system that can also machine your parts to extremely tight tolerances consistently every time. Silver City Aluminum has really become masters of creating custom pneumatic and hydraulic punches. We have the ability to create custom punches for low or high volume jobs, allowing for the highest standard of quality and consistency. We have two B & O state of the art, precision saws for finish cutting our extrusions. 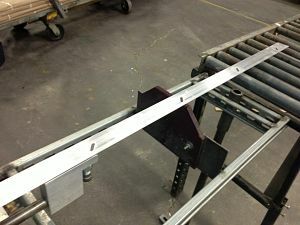 They are capable of consistently holding the tightest tolerances, for pieces ranging from ¼” to 240” long. We also have the ability to miter parts with our mitering saw. It is capable of a miter ranging from 22.5 degrees to 135 degrees, at lengths ranging from 13.75” to 19’-8”.